Connect with top social media engagers, meet Empire Avenue Leaders, super charge your social networking. In April 2015, between the 1st and the 7th, join our free social media event taking place at each Full Moon – via #EAv – and give a boost to your social networking! Image via Wikimedia Commons. May 2014 initial SoMe event was followed by the strawberry, the buck, the sturgeon, the harvest, the hunter, the beaver, the cold, the wolf , the snow and the full worm moons. In the Empire Avenue EAv Gangstas community, you can still access all the conversation threads. 2015.04 #FullMoonEngageMe N°12 The Pink Moon – EAv thread. 2015.03 #FullMoonEngageMe N°11 The Worm Moon – EAv thread. 2015.02 #FullMoonEngageMe N°10 The Snow Moon – EAv thread. 2015.01 #FullMoonEngageMe N°9 The Wolf Moon – EAv thread. 2014.12 #FullMoonEngageMe N°8 The Cold Moon – EAv thread. 2014.11 #FullMoonEngageMe N°7 The Beaver’s Moon – EAv thread. 2014.10 #FullMoonEngageMe N°6 The Hunter’s Moon – EAv thread. 2014.09 #FullMoonEngageMe N°5 The Harvest Moon – EAv thread. 2014.08 #FullMoonEngageMe N°4 The Sturgeon Moon – EAv thread. 2014.07 #FullMoonEngageMe N°3 The Buck Moon – EAv thread. 2014.06 #FullMoonEngageMe N°2 The Strawberry Moon – EAv thread. 2014.05 #FullMoonEngageMe N°1 Start – EAv thread. Read our FAQs and use the comment section to ask any question about the event. En 2016 c’est la 11ème édition de la semaine pour les alternatives aux pesticides! Après une 9ème édition très réussie qui compte à son actif plus de 1 300 actions dans 26 pays, couvrant ainsi tous les continents, la semaine pour les alternatives aux pesticides revient pour une dixième édition du 20 au 30 mars 2015. Perturbateurs endocriniens, pesticides: 85 médecins du Limousin prennent position. Nos Enfants nous accuseront – Le Film de Jean-Paul Jaud. Le viticulteur Emmanuel Giboulot et son combat contre les pesticides. Si vous possédez un compte flickr®, ajoutez-nous comme contact. HEE have developed a film in partnership with NHS England explaining how Proton Beam Therapy works and what impact two state of the art centres in the UK will have on the service that the NHS provides. Proton Beam Cancer Therapy should be available in the UK from 2018. Video published on 10 Mar 2015 by HealthEducationEng. Watch more research videos on @DES_Journal YT channel. 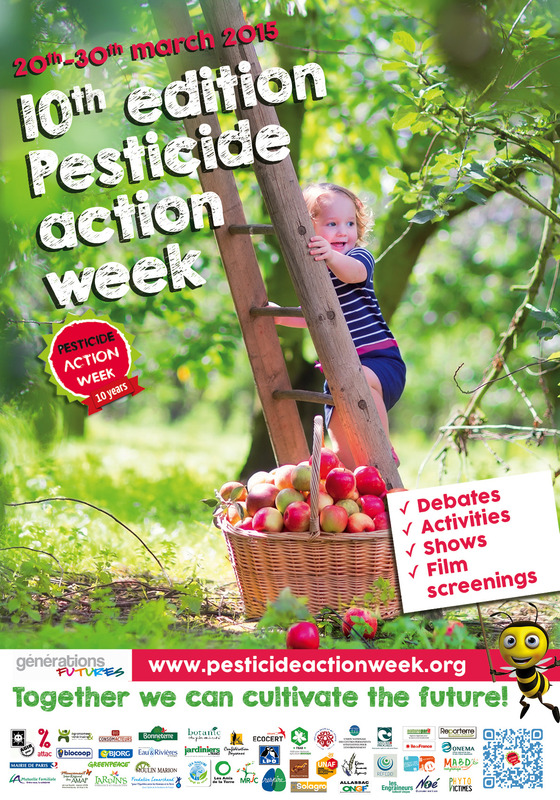 Join the Pesticide Action Week! Add your voice to this expanding international movement: get involved! The Pesticide Action Week is an annual and international event, open to everyone, with the aim to promote alternatives to pesticides. The campaign takes place during the first ten days of every spring when usually the spreading of pesticides resumes. Initiated in 2006 by the French organisation Générations Futures, this event currently takes place in more than 16 countries worldwide. Every year the event gets bigger and stronger in Europe and globally. Watch the video. 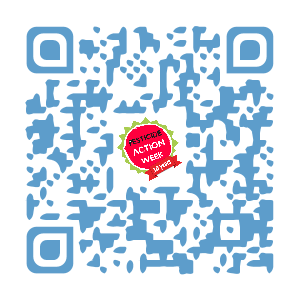 For the poster, flyer, QR code, postcards, screensavers, banners, logo, press, contact and more, vist pesticideactionweek.org. Author DES DaughterPosted on 20/03/2015 20/03/2016 Categories BlogTags Pesticides, SPAP2 Comments on Join the Pesticide Action Week! Le texte original de cet article provient de Générations Futures. Dans le cadre de la loi sur la biodiversité débattue en ce moment à l’Assemblée Nationale, les Députés viennent d’adopter un amendement interdisant l’usage des néonicotinoides à compter du 1er janvier 2016.. Image via thierry ehrmann. C’était une demande portée par plusieurs élus (à la fois EELV et PS). De nombreuses associations, dont Générations Futures, avait proposé des amendements en ce sens. L’adoption de cette interdiction de « L’usage des produits phytosanitaires de la famille des néonicotinoïdes [… ] à compter du 1er janvier 2016. » est une bonne nouvelle. Il faudra cependant s’assurer que cet amendement N°754 ne soit pas revu lors du passage au Sénat et amendé avec de possibles dérogations. Pour rappel les néonicotinoides sont mis en cause dans la disparition de nombreuses colonies d’abeilles. Après le rejet de la résolution Labbé sur ce même sujet, voilà une bonne nouvelle en prévision du lancement demain de la 10ème Semaine pour les alternatives aux pesticides! D’autres articles sont encore à débattre notamment l’article 51 concernant le date d’entrée en vigueur de l’interdiction des pesticides en milieu urbain (avancée à 2016). Nous espérons aussi une bonne surprise sur ce point qui devrait être débattu dans les prochaines heures. Abeilles : l’Assemblée vote l’interdiction des insecticides néonicotinoïdes en 2016, le monde, 19.03.2015. Abeille/pesticides: L’AN vient d’adopter un amendement interdisant l’usage des néonicotinoides début 2016, Générations Futures, 19 mars 2015. In cases of severe illness, antibiotics are usually prescribed while waiting for the results, and this can contribute to antibiotic resistance. A new blood test was good at distinguishing between viral and bacterial infections, and separating people with and without an infectious disease. This opens the potential to improve management of patients with acute infections and reduce antibiotic misuse. A new blood test helped researchers from several institutes and medical centres in Israel tease out whether an infection is caused by a virus or bacteria within two hours. Bacterial and viral infections are often clinically indistinguishable, leading to inappropriate patient management and antibiotic misuse. Bacterial-induced host proteins such as procalcitonin, C-reactive protein (CRP), and Interleukin-6, are routinely used to support diagnosis of infection. However, their performance is negatively affected by inter-patient variability, including time from symptom onset, clinical syndrome, and pathogens. Our aim was to identify novel viral-induced host proteins that can complement bacterial-induced proteins to increase diagnostic accuracy. Initially, we conducted a bioinformatic screen to identify putative circulating host immune response proteins. The resulting 600 candidates were then quantitatively screened for diagnostic potential using blood samples from 1002 prospectively recruited patients with suspected acute infectious disease and controls with no apparent infection. For each patient, three independent physicians assigned a diagnosis based on comprehensive clinical and laboratory investigation including PCR for 21 pathogens yielding 319 bacterial, 334 viral, 112 control and 98 indeterminate diagnoses; 139 patients were excluded based on predetermined criteria. The best performing host-protein was TNF-related apoptosis-inducing ligand (TRAIL) (area under the curve [AUC] of 0.89; 95% confidence interval [CI], 0.86 to 0.91), which was consistently up-regulated in viral infected patients. We further developed a multi-protein signature using logistic-regression on half of the patients and validated it on the remaining half. The signature with the highest precision included both viral- and bacterial-induced proteins: TRAIL, Interferon gamma-induced protein-10, and CRP (AUC of 0.94; 95% CI, 0.92 to 0.96). The signature was superior to any of the individual proteins (P<0.001), as well as routinely used clinical parameters and their combinations (P<0.001). It remained robust across different physiological systems, times from symptom onset, and pathogens (AUCs 0.87-1.0). The accurate differential diagnosis provided by this novel combination of viral- and bacterial-induced proteins has the potential to improve management of patients with acute infections and reduce antibiotic misuse. A Novel Host-Proteome Signature for Distinguishing between Acute Bacterial and Viral Infections, PLOS one, DOI: 10.1371/journal.pone.0120012, March 18, 2015. Rapid blood test to ‘cut antibiotic use’, BBC News Health, 19 March 2015. New blood test could help prevent antibiotic misuse, NHS Choice, March 19 2015. With Apple’s new ResearchKit, doctors can design apps that allow users to quickly and easily participate in medical studies. Image via Apple. With iOS 8, Apple introduced HealthKit, a powerful tool that allows health and fitness apps on iPhone to work together. Over 900 apps have already been developed using HealthKit, transforming how we track, manage, and interact with our health. The biggest challenge in medical research is that it takes so long to organize the studies but what if it could be done at the click of a button? With a user’s consent, ResearchKit can seamlessly tap into the pool of useful data generated by HealthKit — like daily step counts, calorie use, and heart rates — making it accessible to medical researchers. With ResearchKit, iPhone and iPad users will be able to search and sign up for specific medical studies on everything from Parkinson’s disease to diabetes, asthma to breast cancer. Apple makes it easier to join medical studies, mnn, Mar 18, 2015. The Next Disruptor of Clinical Trials? Try Apple, mmm, MARCH 11, 2015. ResearchKit An “Enormous Opportunity” For Science, Says Breast Cancer Charity, techcrunch, 2015/03/14. ResearchKit Technical Overview, apple, March 2015. Overdiagnosis is an important health care issue and hopefully this video highlights a number of the issues around this important problem. Bridge over Diagnosis – a parody of the Simon and Garfunkel classic Bridge over Troubled Water. Video published on 10 Mar 2015 by James McCormack. Watch more sketches – shows videos on @DES_Journal YT channel. Prothèses mammaires: LAGC-AIM, l’affaire de trop? Marisol Touraine, Ministre des Affaires sociales, de la Santé et des Droits des femmes, a tenu, ce Mardi 17 mars 2015, un point presse pour aborder la survenue d’une pathologie rare, le Lymphome AGC-AIM lié aux implants mammaires. Le contenu de cet article provient du Ministère des Affaires sociales, de la Santé et des Droits des femmes. Depuis l’affaire des implants mammaires PIP en 2010, les autorités sanitaires ont renforcé les actions visant à suivre les femmes porteuses d’implants mammaires, dispositifs médicaux considérés à risque, et à s’assurer de la qualité de ceux-ci. Dans le cadre de ce suivi, elles ont mis en évidence la survenue de Lymphome Anaplasique à Grandes Cellules Associé à un Implant Mammaire (LAGC-AIM). Ces lymphomes, très rares, ne sont observés que chez les femmes porteuses d’implants mammaires. Ce ne sont pas des cancers du sein et ils sont dans l’ensemble de bon pronostic. Aucune prothèse spécifique, marque ou enveloppe particulière n’a jusqu’à présent été directement mise en cause. La France dispose de l’un des meilleurs systèmes de détection de cette pathologie. Sa surveillance constante et la mise en place, dès 2009, du réseau Lymphopath (dispositif unique au monde d’analyse des lymphomes) ont permis de détecter 18 cas en France depuis 2011, alors que l’on estime à 400 000 le nombre de femmes qui portent des prothèses. Un décès a été constaté. Dès 2011, l’Institut National du Cancer (Inca) a ainsi formulé des recommandations sur la conduite à tenir pour les femmes porteuses d’implants mammaires. A l’initiative de la France, la commission européenne a mis en place une Task force permettant d’échanger les données sur cette pathologie et d’améliorer la coopération entre les 28 Etats membres. Marisol Touraine a été alertée par le dernier bilan des autorités sanitaires identifiant 9 nouveaux cas de LAGC en un an. Elle a alors immédiatement demandé à l’INCa de réunir les experts pour actualiser ses recommandations. Par ailleurs, un groupe ad-hoc d’experts a été mis en place par l’Agence nationale de sécurité du médicament et des produits de santé (ANSM) afin d’investiguer plus avant le rôle de certaines prothèses dans l’apparition des LAGC-AIM. La Haute Autorité de Santé (HAS) a également été saisie pour élaborer des recommandations sur les indications et les contre-indications relatives à la pose d’implants mammaires, les éventuelles restrictions à leur pose et les alternatives possibles. Sans attendre le nouveau règlement européen sur les dispositifs médicaux, Marisol Touraine a déposé un amendement au projet de loi de modernisation du système de santé visant à renforcer le suivi et la traçabilité des dispositifs médicaux. Cet amendement impose aux industriels de fournir un résumé des caractéristiques du produit à l’ANSM et la tenue de registres dans les établissements de santé. les experts ne recommandent pas aux femmes porteuses de prothèses mammaires de demander leur retrait. Marisol Touraine a tenu à rassurer les femmes porteuses d’implants mammaires et a demandé aux autorités sanitaires de poursuivre leur surveillance. QUESTIONS‐REPONSES Femmes porteuses ou ex‐porteuses de prothèses mammaires et survenue de lymphomes anaplasiques à grandes cellules (LAGC), social-sante.gouv.fr. LYMPHOMES ANAPLASIQUES À GRANDES CELLULES ASSOCIÉS À UN IMPLANT MAMMAIRE, AVIS D’EXPERTS, social-sante.gouv.fr. Prothèses mammaires : l’affaire de trop?, leparisien, 17 Mars 2015. Prothèses mammaires et « nouveaux cancers» : le curieux rebondissement d’une affaire connue depuis six ans, jeanyvesnau, 17 mars 2015.